Yes, we are still waiting on the Highway Patrol report and resolution to our insurance claim. But that is not why we are still at Sam’s Spa and Family Resort. After a very busy 6 weeks in Colorado over the holidays we are just happy to “chill” out here at Sam’s. I do mean “chill”. The weather has been in the mid to high 50’s during the day and the low 30’s overnight – much colder than usual even for this time of year. The relaxing part has been great. Not that we have not been keeping busy. I have started back running after taking a several month hiatus. I should know better – I will pay the price getting back into running shape. We have managed to squeeze in three movies - Silver Lining Playbook, Gangster Squad and Zero Dark Thirty, Silver Lining was our favorite. 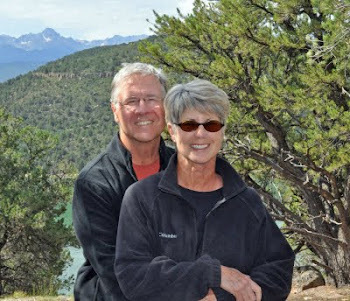 Last Thursday we got a visit from Rick Doyle a fellow blogger of Rick & Paulette’s RV Travels. It was fun meeting Rick in person and sharing some of our adventurers. Tonight the 4 of us have a dinner date at Sherman’s Deli and Bakery. We have never been there and from what we hear we are in for a real treat. Saturday we watched the Bronco game – enough said. Yesterday, we took off early and headed for the Salton Sea, Salvation Mountain and Slab City. Our first stop was the Salton Sea History Museum & Visitor Center. We had no idea this museum even existed until we saw a small roadside sign. It is off the beaten path but was well worth the slight detour. We were lucky as it is only open on Fri, Sat, & Sun. This is clearly a passion for founder Jennie Kelly. Jennie is a life long resident of the Coachella Valley and many of the exhibits in the Museum are her personal collections and creations. She spent about an hour with us as our personal guide and storyteller. We learned a ton and she brought much of the Salton Sea to history to life. On the way out of the museum we met her 92-year-old dad. Next we started our trip around the lake. 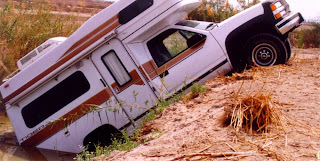 We had been here before in 2000 Check out this picture of how that trip ended up! I am happy to report this trip was not a repeat and turned out much better. It was a perfect day to travel long the North and East shore. 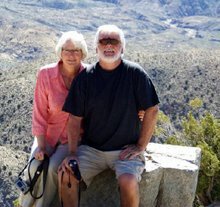 If you are not familiar with the Salton Sea I would highly recommend you clicking on the link above and reading about this very unique place. It was then off to Salvation Mountain and Slab City, and the big surprise of the day…Mud Volcanos. The three are fairly close to each other and if you are not an RVer you may not be familiar with these spots. Again, many videos, blogs and articles have been written about both. Salvation Mountain is clearly one of these quirky places that you have to see to believe. Slab City…well, it isn’t for everyone. The Mud Pots or Mud Volcanos are formed in a geothermal area on the St. Andreas fault where the water is pushing the ash or mud up to the surface forming mini volcanoes. This is a virtually undiscovered area where one can get up close and personal as the mud pots burp, gargle and croak without a sign to mark their presence and without a fence to protect them. When we eventually get west, we will visit the Salton Sea area to see if it is "for us." The pictures sure show an interesting place. We had been in that area 4 times but we never knew of the Mud Flats and other interesting spots to see. @E Squared and Mui - Thanks and glad you enjoyed the photos. We had been talking about going there for some time and finally made it! @lowestravels.com Yes, the mud flats were fun and really fascinating! Watch out! Crash! What was that?